‘The Vice Chancellor of Dhaka University urges increased intercommunication’ would be an English translation of part of the headline of a Banglanews24.com report on a seminar held at the premises of DU on October 26, 2013. Readers who do not know what that seminar was about, but know a thing or two about the current political situation of the country, may be forgiven for thinking that the DU Vice Chancellor – a professor of journalism and mass communication – was talking about the kind of communication or dialog that many Bangladeshis had on their minds. After all, the seminar took place on a day when – on October 26 in the evening – the much talked about telephone conversation between Prime Minister Sheikh Hasina and the Leader of the Opposition Khaleda Zia took place. The Vice Chancellor, however, was talking about communication among different ‘anthropogroups’, i.e. human groups. The term ‘anthropogroup’ is not one you are likely to find in any dictionary, for I have coined it for this discussion. But there is a reason: in terms of relative novelty and etymological parallels, this term would be the nearest English equivalent of a Bangla neologism, nrigoshthi, which has been coined – based on Sanskrit root words – as a synonym for ‘ethnic group’, though that is not necessarily how everyone in Bangladesh understands the term. Not unlike the usage of the English term ‘ethnic (group)’, the newly coined ‘nrigoshthi’ too is often used mainly in the context of ethnic minority groups. Now, many people belonging to such groups in Bangladesh identify themselves, and would like to be recognized by the state, as Adivasi, a term that they deploy in the sense of ‘indigenous people’ (IP), as used by international bodies such as ILO and the UN. The present government, however, has not quite accommodated this demand, despite promises and expectations uttered in the past by key actors – including leaders of the current ruling party – at various levels for years. This setback has led to considerable disillusionment among IP leaders and activists of the country. Perhaps it was out of sensitivity to this fact that a Daily Star news report on the seminar under question was concluded by the following statement: ‘Dhaka University Vice-Chancellor Prof AAMS Arefin Siddique underscored the need for effective communication among indigenous communities to bridge gaps.’ Through this innocuous looking statement, however, the report misses, or misrepresents, the whole purpose of the seminar. Judging by news reports and the views of some of the academics who presented papers, the seminar had a central theme that the so-called ‘small ethnic minorities’ of Bangladesh could not be recognized as ‘indigenous people’, and that doing so would be against ‘national interest’. The seminar under question was actually not a very well-publicized affair. It was first brought to my attention by a Facebook friend who wanted my ‘expert’ opinion on the seminar, a day after it was held. I found the title of the seminar as he mentioned quite intriguing, since it contained terms that I had not come across before. (The Daily Star report referenced above translated the title as follows: “A unified people of all sects in Bangladesh and public attention to Chittagong Hill Tracts”! Bilingual readers may wish to compare this with the original Bangla formulation.) Thus, out of curiosity, I performed some Google search to learn more about the seminar, and found out that the organizers also used an uncommon Bangla construction (again, derived from Sanksrit) – shastriyo sobha – that presumably meant ‘academic seminar’. Although the name of the organization that hosted the seminar was not known to me, the university professors who were present onstage as chair, chief guest and paper presenters were all distinguished academics that I knew of, and/or had known personally. I also knew that some of them held strong views against the notion of ‘indigenous people’, as had been seen in their articles and views previously published on newspapers. Thus to the Facebook friend who wanted my ‘expert’ opinion on the seminar, I simply said, “Knowing what I know about the views of some of the academics involved, I think their papers may contain stuff that would create a lot of heat, but very little light.” I also added that I was not the kind of expert who was comfortable speaking about things that one had little knowledge of! Beyond my initial comment on Facebook, as mentioned above, I had no intention of getting into any detailed discussion or debate relating to the seminar under question. But when I came across a provocatively headlined report on the seminar in an online news site related to the CHT, I got really fired up. The report carried a headline that suggested that Professor Anisuzzaman, a well-known public intellectual who attended the seminar as chief guest, said that ‘khudro nrigoshthi’ (small ethnic group) was the appropriate designation for the ‘non-Bengali minorities’ of the CHT. As I read on, it seemed that the main objective of the seminar, presided over by the DU Vice Chancellor, was to (re)assert what had already become a well-established government position, i.e. that the label ‘indigenous people’ should not be applied to the so-called ‘small ethnic groups’ (or ‘minor races’) of the country. Given that the constitution, as amended in 2011, had already fixed the labels ‘tribes, minor races and ethnic sects’, inane pronouncements by partisan intellectuals in support of a fait accompli seemed nothing but adding insult to injury for the IPs. It was such a feeling that prompted me to write an open letter to Professor Anisuzzaman. It is quite likely that the news headline that I came across on Facebook was more of a misrepresentation of what Professor Anisuzzaman had said at the seminar that he attended as Chief Guest. However, even if he did not directly say anything too outrageous, he was at least guilty by association, because views expressed by some of the other academics – as reported in the media, and verified by this author in a few cases – were quite problematic, both academically and politically. Collectively, the professors who presented papers in the seminar did little more than air their views in line with the current government position on the question of indigenous people. How convenient! My reading of some of the secondhand reports as well as firsthand reading of some articles written by the professors under consideration may be summarized as follows: academic knowledge and perspectives from different disciplines do not support the claims by the non-Bengali ‘small ethnic groups’ of Bangladesh to be recognized as ‘indigenous people’. The disciplines invoked were history, archeology, political science and anthropology (Of these, all but anthropology were represented by speakers who were present). Incidentally, the organization that hosted the seminar has a Bangla name (Satyanweshan) that means ‘The search for truth’. But instead of truth, what I could hear or read from a distance, both in terms of the papers presented at the seminar, and how news about it was disseminated by some sections of the media including anti-IP groups active online, were mainly fabrications! The biggest one of all, perpetuated by those in power and other vested interest groups across a wide political spectrum, is that the notion of indigenous people, and the politics and people that want to establish this identity, are a threat to ‘national sovereignty’. I begin the letter (dated October 28, 2013) by recalling my last face-to-face interaction with Professor Anisuzzaman in the evening of a full moon night exactly a year ago, on October 29, 2012, when some concerned citizens showed up at the central Shahid Minar (Language Martyr’s Monument) in Dhaka to light up candles in protest of attacks on Buddhist minorities in Ramu just a month earlier. I then explain the background as to why I was writing the open letter. I draw attention to some questionable passages from the published articles of Professor Khurshida Begum – one of the academics present in the seminar – whose language and arguments come across as quite offensive or hostile to IPs, and in some places can even be characterized as being racist (I do not offer such judgments explicitly in my letter though, and instead ask Professor Anisuzzaman to form his own opinion). Continuing further in my open letter to Professor Anisuzzaman, I recall our previous encounter in 1997, the year when the CHT ‘Peace’ Accord was signed. I remind him that before the accord was signed, he, along with several other colleagues of his from Dhaka University, had taken part in a government-sponsored visit to the CHT to see ground realities for themselves. They were flown around in army helicopters, as we learn from an account Professor Anisuzzaman himself wrote as part of his memoirs serialized in the Bangla daily Prothom Alo. While recounting his experience of the visit, he talks about meeting me on the road in the CHT (he indicates that he knew me from before, and that he was quite fond of me). He was travelling in an army vehicle, from which he saw me on a rikshaw, whereupon he got off his car and caught up with me to ask me to go see him later in the evening. Then he reports that I did not show up, and speculates that this was probably because I was shocked to see him riding in an army vehicle. Apparently, when I saw him on the road, I gave him a Ceasarian look, ‘Et tu Brute? (Even you, Brutus?)’. In this context, I tell ‘sir’ that no such question was actually on my mind in 1997, but that it did cross my mind upon seeing his name in the news headline on the seminar of October 26, 2013. 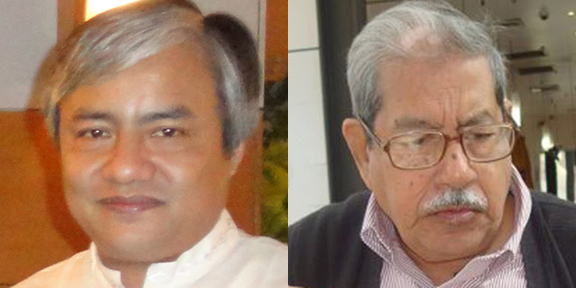 Before ending my letter, I ask Professor Anisuzzaman whether he could do something about the conceptual and terminological mess that the discourse of ethnicity and national identity in Bangladesh is in. As examples, I tell him why a term like ‘nrigoshthi’ is problematic, and that the official English term for the constitutional label ‘khudro jatisotta – ‘minor race’ – is also not quite right (something like ‘minority nationality’ would have been more appropriate). In another place, I also express surprise that he himself, despite being a professor of Bangla, had in the past used the Bangla term nritattwik goshthi – literally, ‘anthropological group’ (cf. my feedback to New Age in 2012, Lost in translation) – to mean ethnic group. I end my letter by rhetorically reassuring Professor Anisuzzaman that I still respect him and have faith in his intellectual integrity. I also urge him to shine on as a bright light in an intellectual landscape that is full of darkness. Prashanta Tripura is an academic anthropologist (originally at Jahangirnagar University) turned development professional. He is currently engaged in independent consultancies and part-time teaching, with some writing and voluntary social work on the side. Previous Where is the Antidote to Communalism? Another lively and stimulating piece from Professor Tripura. The coinage of all these terms and their deconstruction are extremely key in the political discourse of Bangladeshi nationalism (which may be just as messy as Indian nationalism, despite our small size and “homogeneity” – some have even said we are like Japan – but of course Japan is not homogenous either, the discourse of Japanese nationalism assumes that it is. The punch line of the story – that the usage of Bengali to create all the different terms to erase the Bengladeshi nationality of adibashis was far more poignant than riding in an army jeep – makes we want to read more from Professor Tripura on a regular basis. I respect your point of view. But we are starting from a low base. I think you expect too much and in seeking it, and attacking the good people, you risk only leaving space for the bad ones. I don’t know if it is helpful to divide people as ‘good’ and ‘bad’, or to see questions or criticisms as ‘attacks’. However, if we must live in a binary world, then I would be more comfortable dealing with ‘bad people’ that do not pretend to be friends than the ‘good ones’ who do, but whose words and actions do not match.